Are you on the lookout for the most stylish way to ensure your canine remains safe and comfy? If so, keep on reading! Decorative dog kennels don't just look great, but they're functional as well! They ensure your pets are kept safe and comfy with the ample space that they provide dogs for sleeping and playtime. To ensure you get the best kennel for your dog, take measurements of the space that you can allocate for your pooch before you decide on a product. You need to make sure your dog can fit inside it and it has ample wiggle room. Of course, it is better to pick a kennel that can last through the growth spurts of your dog. Consider the estimated adult size of your pup even when a puppy will use the kennel that you'll be getting. The next thing you need to consider is a kennel's portability. If you want to give your dog a permanent home, one that isn't portable, then you can go for the largest that you can find. As for the material, the heavier and sturdier it is, the better. More portable crates, on the other hand, are easier to move between homes. They can be taken with you during your camping trips. Just make sure that the portable crate you get is one that can hold your dog's weight as you'll be carrying it. Dog kennels offer plenty of ventilation. However, for a portable unit, it must at least be partly mesh so your dog can breathe and feel cool while it's inside the crate. Consider all these aspects as they are important for your dog's happiness and well-being in its new home. Now that you know what to look for in decorative dog kennels, it is time for you to check out our top picks! The first decorative dog kennel on our list is one that has a rather unique shape - an octagon, that is! 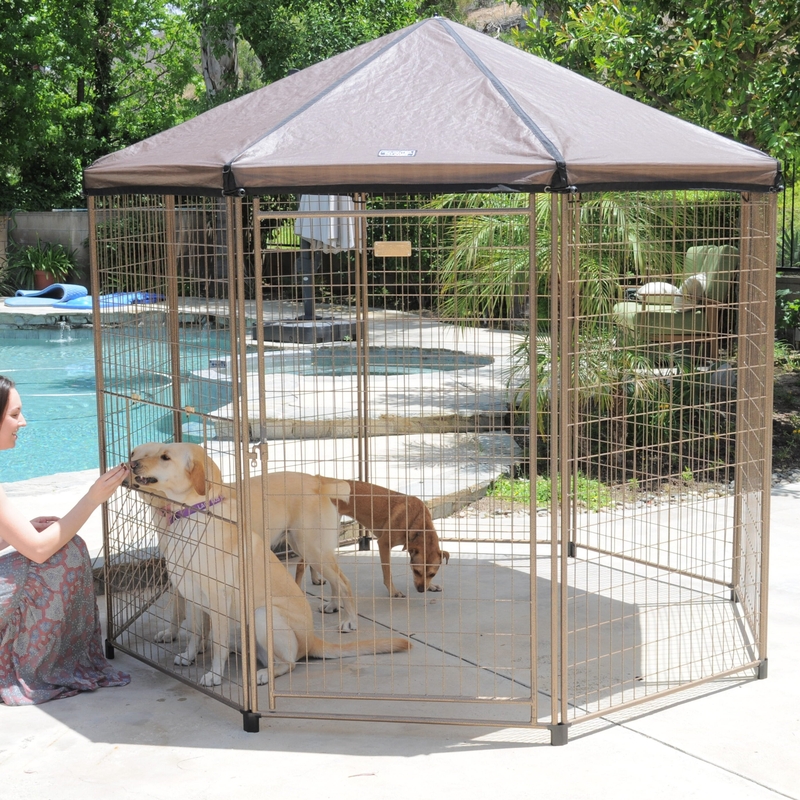 It's an eight-sided playpen that will give your dog a comfortable and convenient place to relax. Made for outdoor use, it offers plenty of room. It is made of steel, which is long-lasting, tough, and durable. The shade is there to ensure your dog can stay cool during the day and dry during rainy weather. Also an Advantek product and octagonal pet gazebo, it is an outdoor kennel made for small to intermediate-sized dogs. It's easy to assemble for mobility, plus it comes with a spring-loaded pet-proof lock to ensure your pet is safe and secure inside its gazebo. It's garnered the second place on our list of the best decorative dog kennels for the flexibility it offers in combining with other kennels. The Kennel Castle of K9 Kennel is a favorite among dog owners for its size, functionality, and design. This can serve as your dog's permanent residence as it comes with insulation to keep your pet warm during the winter season. The castle can fit even the largest of dog breeds including Great Danes, German Shepherds, Mastiffs, and Saint Bernards. Consisting of climb-resistant metal mesh, tough steel tubing, and fabric roofing, this product can be the only crate that your dog will need its entire life. It, therefore, makes the value of this decorative dog kennel unquestionable. What we love most about this particular unit is its wire which is a heavy gauge with tight placement. It certainly is worthy of its heavy-duty title. This portable dog crate is lightweight, easy to store, and easy to transport. As if those things weren't enough, it is also the most flexible unit we've seen around. It can be used as a large kennel or divided into compartments to separate your pets. Since it is made to be your travel companion, it comes with built-in straps so you can safely connect the entire unit to a seatbelt. This dog kennel for indoor and outdoor use makes use of plastic as its primary material, but owners have no issue in terms of the product's quality despite it being 100% synthetic. It's also a flexible kennel as it can be taken apart so you can use it as a dog gate. Consider getting this kennel if you want your dog to have a colorful and protected play space that's up to 18.5 sq ft. If you are on the lookout for a collapsible tent for your dog, then this nylon kennel from Pet Life is fantastic. The material is breathable and it comes with comprehensive instructions to assist you with its setup. The fabric is water resistant with flooring that's humidity proof to offer a comfy home for your pet as you camp in the woods. Also constructed out of wire, mesh, and nylon, it is a great tent for a dog up to 40 lbs. The manufacturer, Tucker Murphy Pet, thoughtfully designed this unit and gave it a rectangular elongated shape to ensure your pet is comfortable inside it. Featuring a unique, curved design, this one's a stylish option. It's also offers a 360 view of what's outside the portable kennel as it's made of mesh and waterproof nylon. Make this you and your pet's travel companion as it can easily allow your dog to feel at home regardless of where it is. Here is an excellent option if you want a good-looking outdoor kennel, especially if you know your dog will chew on its crate regardless of the material. With its powder-coated steel construction, your dog will never have enough teeth to damage its new home. With the 1-year comprehensive warranty the manufacturer offers, it gives you the best bang for your buck.